DIY Tips: Painting Unistrut Perma-Green Channel | Unistrut Service Co.
Perma-Green Unistrut may leave our factory with that familiar, deep green appearance, but this doesn’t mean you can’t paint your channel in the field to achieve a custom color. If you are a fan of Perma-Green’s superior protective finish, but need a different color for aesthetic reasons, this post offers some tips that may be helpful. So, how do you paint Unistrut Perma Green channel? 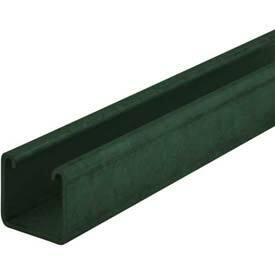 Unistrut Perma-Green Channel is often a great choice because the material vastly exceeds the corrosion resistance performance of conventional finishes. Perma-Green Unistrut offers superior resistance to chalking, checking, and fading and stands up to common acids, solvents and alkalis (Please note that prolonged exposure to any of these materials will eventually cause a deterioration of the material’s finish). No finish lasts forever when subjected to corrosive materials, but you get the point: if you are looking for a rugged, durable finish, Perma-Green is often one of your best options. Painting Unistrut Perma-Green Channel to achieve a custom color isn’t difficult, but you’ll need to keep a few things in mind. For starters, you’ll need to select an application method. The best methods to topcoat factory painted channel are liquid or a powder coat finishes. Both of these applications methods create a thermoset finish with excellent adhesion and performance. Since most contractors don’t typically have access to powder coating equipment, the rest of our steps here assume a DIY project utilizing air-dry paint.Begin prepping your Unistrut Channel by lightly tack sanding the surfaces to be painted, but remember, the goal is to remove some of the gloss of the finish rather than stripping the material down to raw metal. Once complete, clean off all surfaces with a damp rag and allow the channel to dry. With surface prep done, you can turn to applying your air dry paint of choice. As is usually the case, for best results, perform a spot test before painting your entire supply of channel as test data is not available to indicate performance of this type of topcoat. With this said, by following these simple steps, you should be able to apply a custom color top coat to Unistrut Channel with Perma-Green finish with a minimal amount of effort. If you have questions, contact Unistrut Service Company for additional information. Do you have before and after pictures that show a Unistrut Channel paint job performed in the field? If you do, send us your pictures and we’ll gladly post them to our Tech Talk area. *For contractors needing a PDF document for submittal purposes that details how to paint Unistrut Perma-Green, we have a document that can be downloaded here.